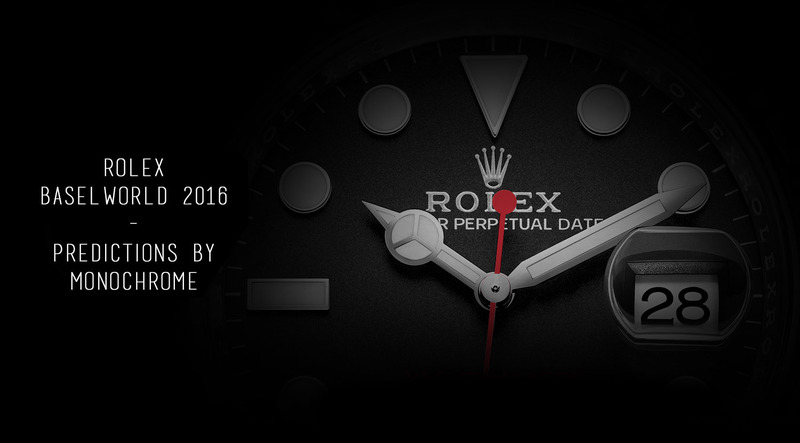 The main debate before Baselworld is what Rolex is going to introduce. Thousands of watch collectors and admirers around the globe want to know what ‘the crown’ has been preparing for the World’s biggest watch show, Baselworld. At Monochrome we also have that debate (of course!) 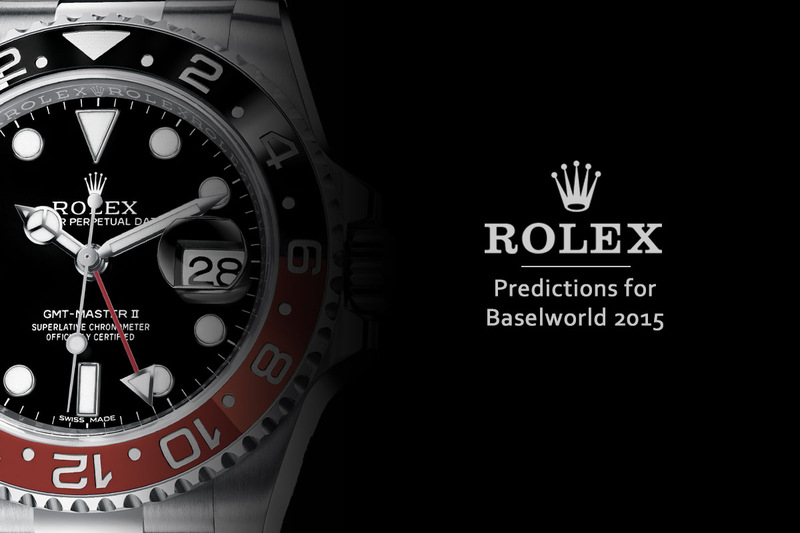 and we love to do predictions that come accompanied with photoshop mock-ups of what we think Rolex will introduce. 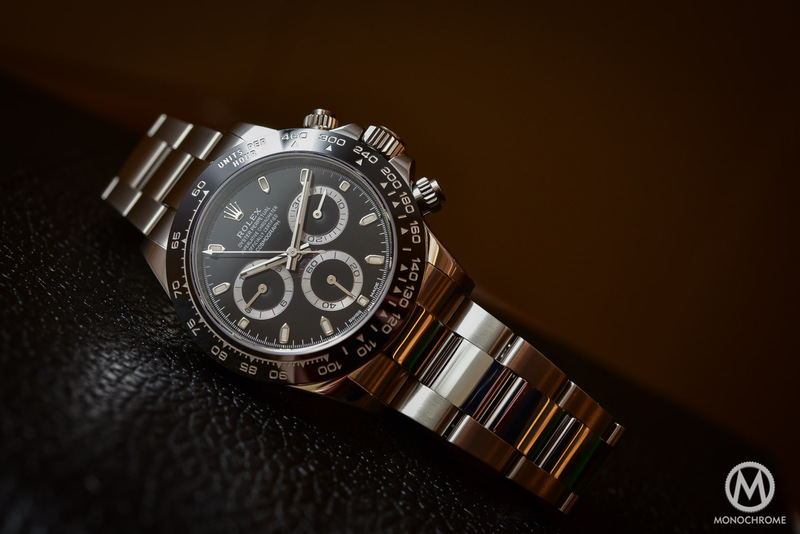 For 2015 we predicted a stainless steel Rolex Daytona with a Cerachrom bezel, however that was not introduced that year. This year however, Rolex has introduced it and it looks exactly like we predicted (or hoped for). 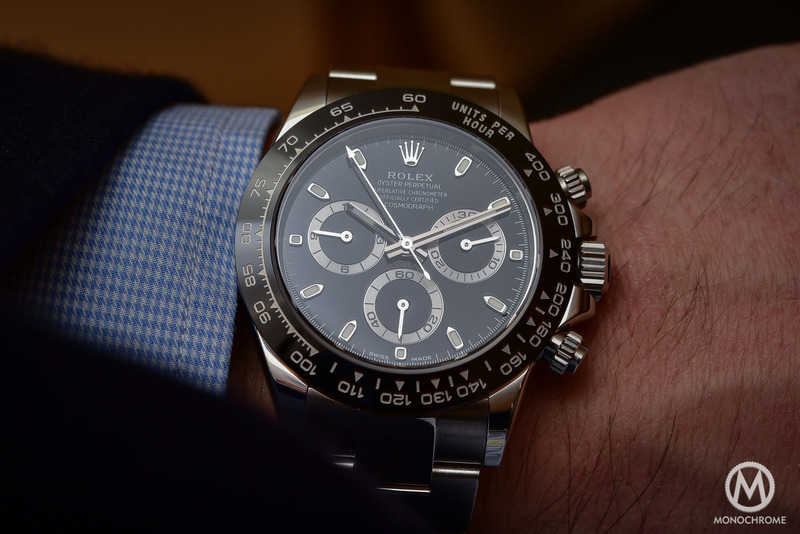 Today we go hands-on with the new stainless steel Rolex Daytona 116500LN with black Cerachrom bezel. 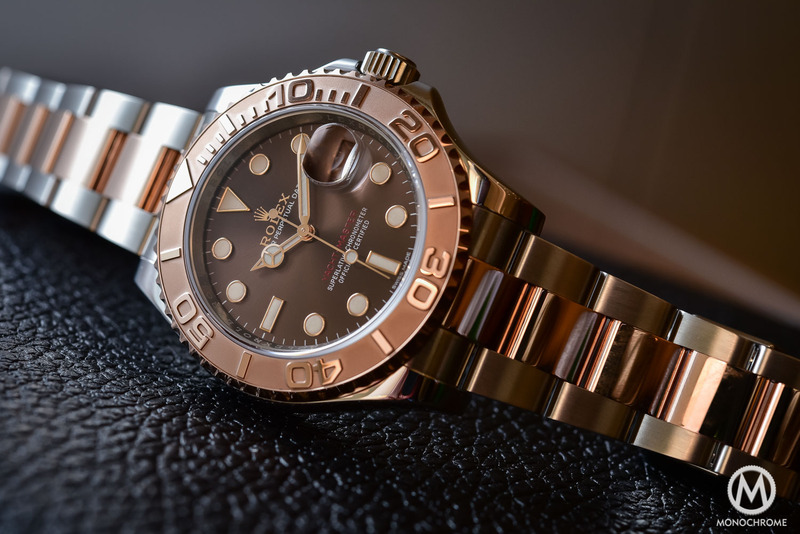 For Baselworld 2016, Rolex made something that will certainly again be THE talking piece of the show. 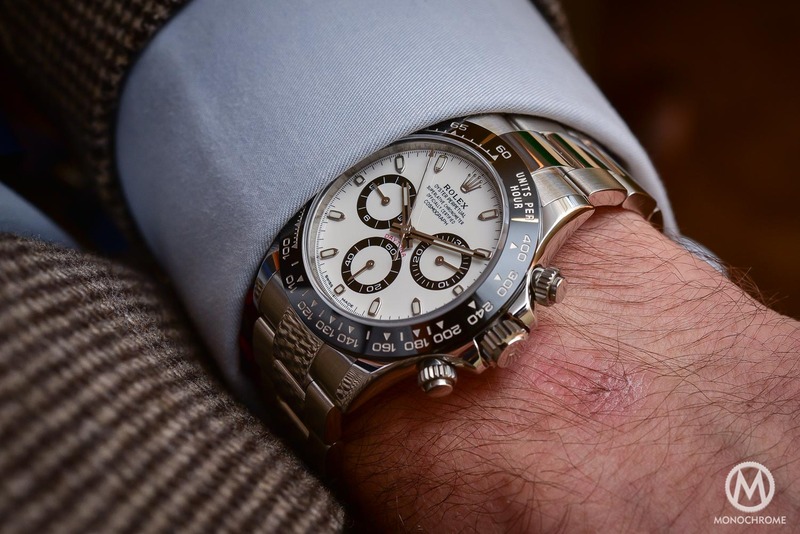 And even if we’re not talking about an entirely new piece, it is a watch that some collectors are waiting for many years – and because we predicted it, we can also plead guilty… A new Rolex Cosmograph Daytona was long awaited by fans of the brand for several reasons. First of all, it remains one of the main success of the brand but on the other hand, it is also a watch that didn’t see any evolutions for 16 years (the present edition was introduced in 2000, alongside the calibre 4130). And even if the improvements are mostly visual ones – and a few technical ones too – this ceramic Rolex Daytona in stainless steel will be a huge success (and there’s certainly no debate to start here). Before going into details, the 2016 Rolex Daytona 116500LN boasts a black Cerachrom bezel, some new details on the dial and an improved movement. Case, hands, base of the movement, (almost all) the dial and bracelet are still the same – and in some ways, why should Rolex change a successful recipe? The first and main thing to note is of course the new black ceramic bezel. 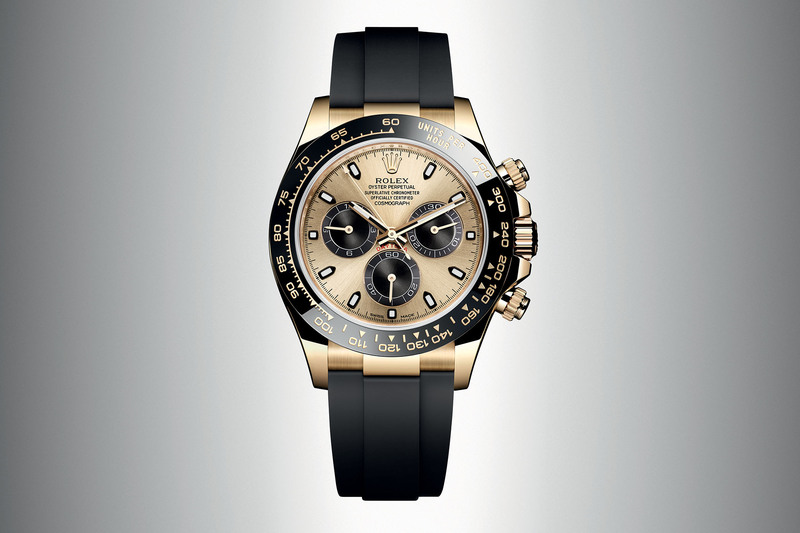 It isn’t a first for the Rolex Daytona, as the Everest Gold edition (ref. 116515LN) and the platinum edition (ref. 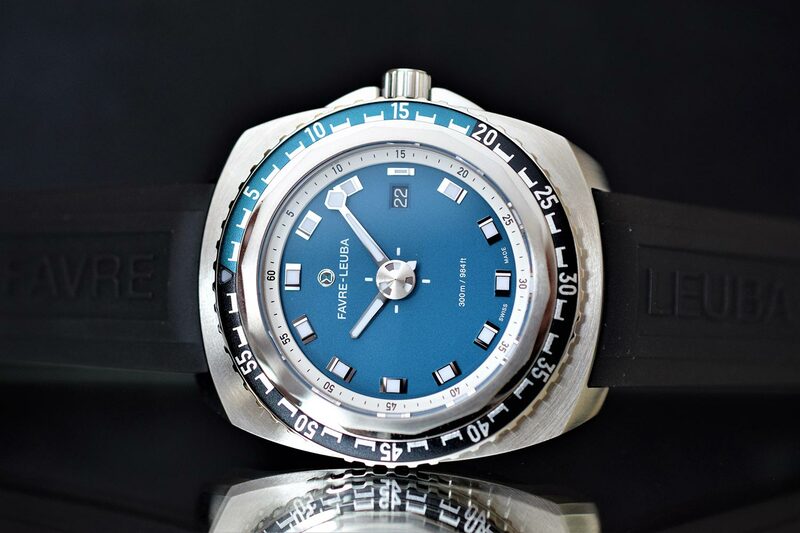 116506) were already fitted with a ceramic bezel. However, it is a first for the stainless steel edition. With a black bezel on the steel Daytona, Rolex makes a sort of back to basics, with a visual reference to the 1965 model (ref. 6240), which came at that time with a black Plexiglas bezel insert (also called bakelite insert). However, this early edition didn’t feature the large red Daytona inscription over the sub-dial at 6. 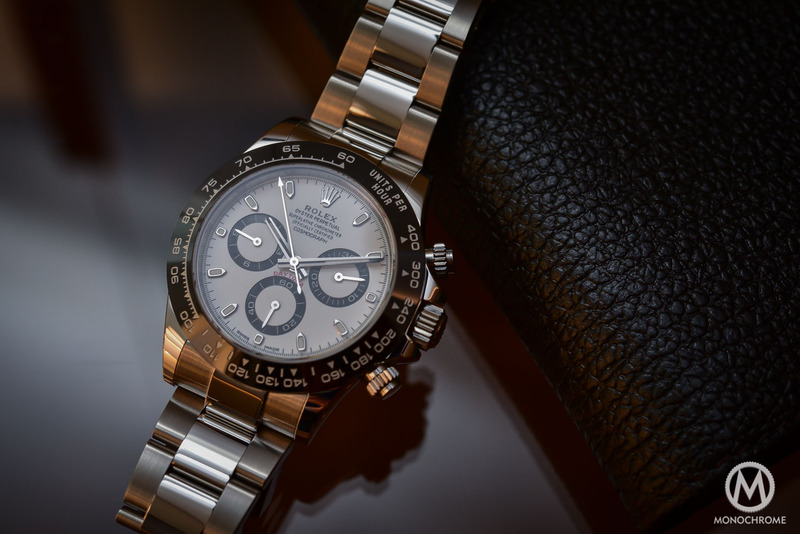 In the actual configuration, the 2016 Rolex Daytona 116500LN is more a tribute to a later ref. 6263 (and that one had the screwed pushers AND the red Daytona logo). Switching the solid and polished bezel for a black Cerachrom bezel actually changes the look of the Daytona more than you can expect. It shines less, it looks probably a bit smaller on the wrist while being more contrasted (especially in white) and more modern. This bezel is monobloc, numerals and scale are engraved on it and then filled with platinum via a PVD process. 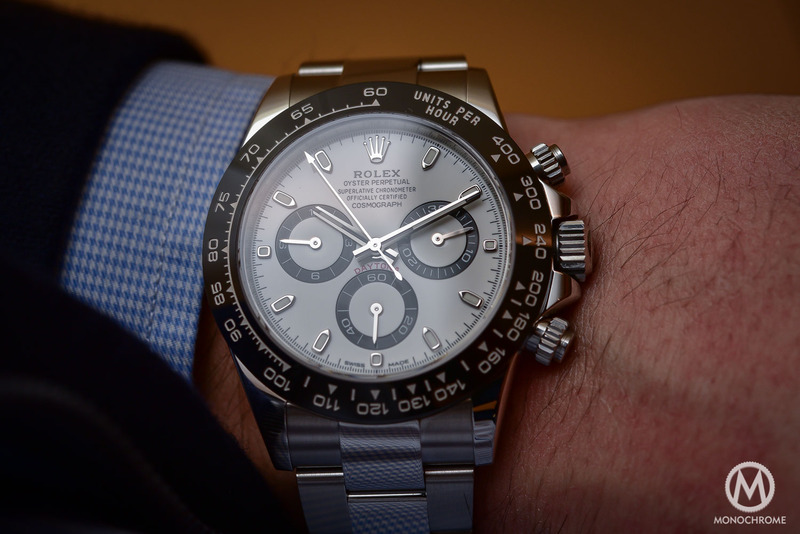 And not only the steel Rolex Daytona 116500LN have a different look but it will also be more resistant, as ceramic is virtually scratch-proof (and owners of the older editions know how sensitive the polished bezel was). Something else to mention is the design of the tachymeter scale. 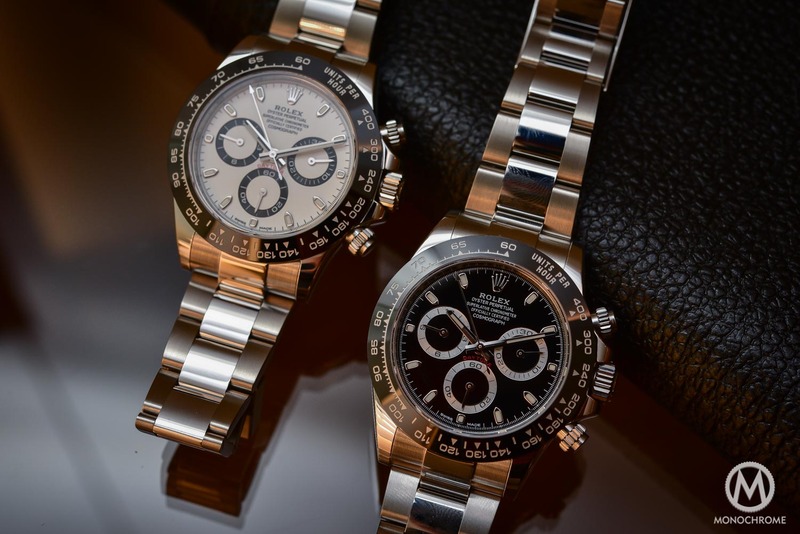 Previously, the steel Rolex Daytona had horizontal numerals. 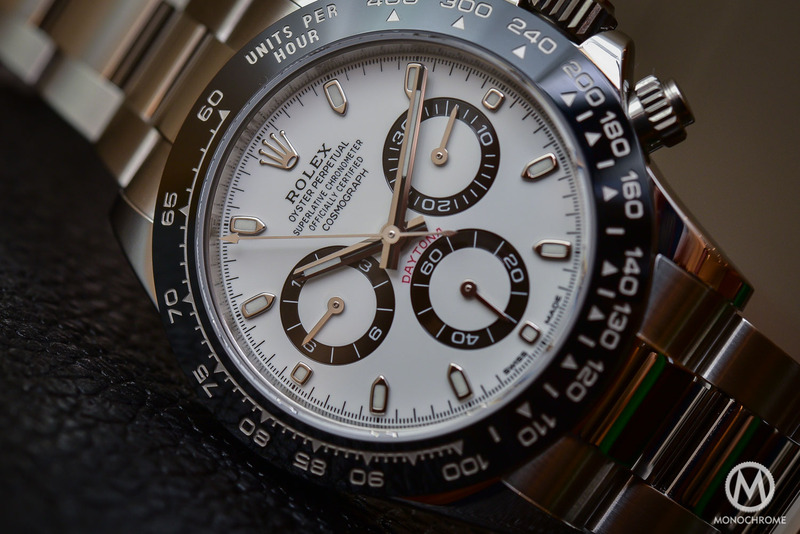 The Rolex Daytona 116500LN now uses the same design as the gold and platinum edition, with a tachymeter scale following the shape of the bezel, and numerals written around it, in a circular shape. Then comes the dial. 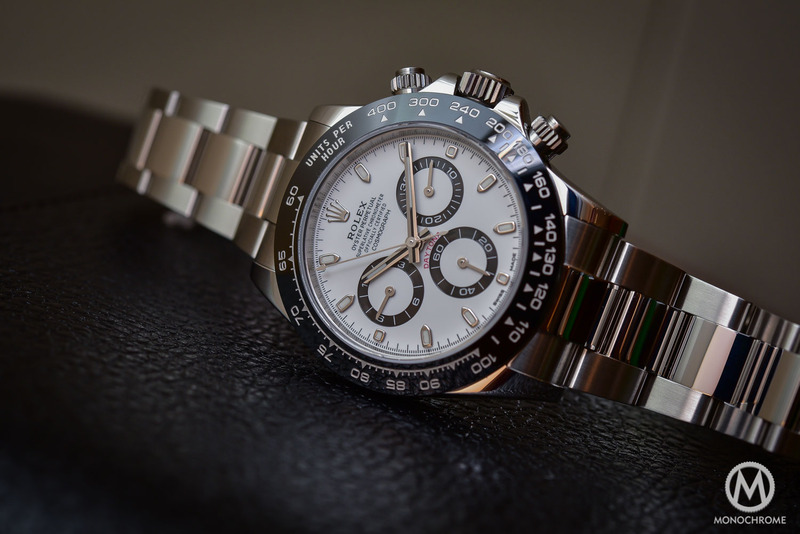 The 2016 Rolex Daytona 116500LN in steel with ceramic bezel will still be available in two editions, white and black, like the previous edition. The indexes are still small pointers (and not numerals like some gold editions), made in 18 white gold, just like the hands – which are still using the same design, with a black line in the middle. 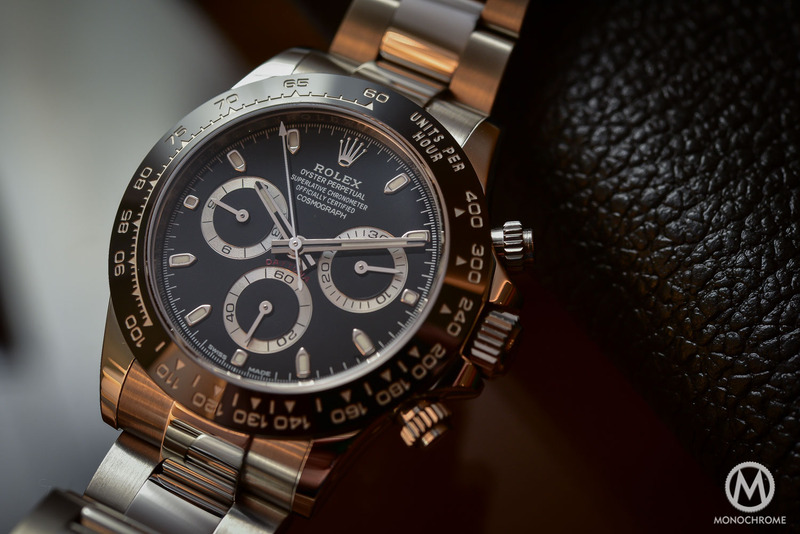 The case and the bracelet of the Rolex Daytona 116500LN don’t undergo any evolution. Still made in 904L stainless steel, still 40mm, still with the screwed pushers, still water resistant to 100m and still with the same surfaces (almost fully polished). The bracelet is also still the same, with the typical Oyster design and satined external links and polished central link. It is mounted on a Oysterlock clasp, with the Easylink extender (which allows to increase the size of the bracelet of approximately 5mm). In fact, visual aspects apart, there’s no news to wait from a wrist test. 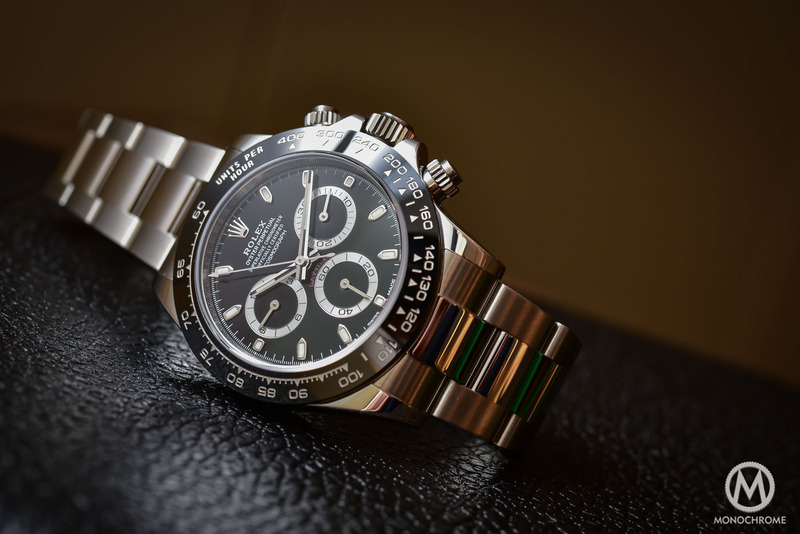 The steel Rolex Daytona 116500LN still looks and feels like a Daytona. If you liked wearing the older editions, you will still enjoy the new ones. Mechanically, the calibre 4130 (with column wheel, vertical clutch, blue Parachrom spiral and 72 hours of power reserve) is still part of the show. However, since 2015, Rolex introduced a new Superlative Chronometer certification, which doesn’t get rid of the COSC certification however but adds more to the old certification. The new certification is done in-house by Rolex, with their own criteria and by their own laboratories (and stricter than COSC). Thus, the 2016 Daytona will benefit from a -2/+2 seconds per day precision – which is rather impressive for a chronograph. It also means that it will benefit from the new 5 years warranty offered by the brand. Availability is not defined yet but the retail price will be 11,300 Euros. More details on www.rolex.com. Ref. 6240 did feature screw down pushers for the first time. You are talking about ref. 6241, with pump pushers. Are you sure the black dial is not different. I think the sundials have been changed from silver to Grey. Thanks for this great rhands-om! Was wondering if the black dial is matte or polished. Thanks! Will you still be able to purchase the steel bezeled version along side the ceramic? Or is the ceramic version the only option? This new timepiece is a pleasant surprise. New subdials in black increase the contrast even more on the white dial helping make for a versatile, go anywhere watch. The clasp seems to fit skinnier wrists better and is an engineering work of art. It’s indicative of a watch maker continuing to make incremental changes over time that are relentless and obsessive in all good ways…compare this to earlier versions and see the attention to detail. Thanks for this great review. Very nice piece, awesome, but without impressive imagination. A copy & mix between zenith #16520, a taste of PN watch 6263 panda version. Nice watch but extremly glossy ! Be carefull when you’re moving outside, for to be discret, it’s not the best watch.